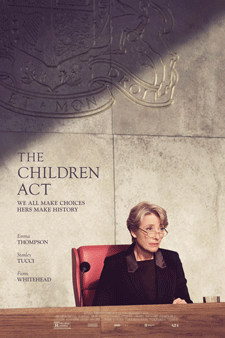 The Sedona International Film Festival is proud to present the Flagstaff premiere of the acclaimed new film “The Children Act” on Wednesday, Jan. 9 as part of the festival’s monthly Flagstaff Cinema Series. There will be one screening of the film at 7:00 p.m. at Harkins Flagstaff 16 Theatres. At issue: whether to order a blood transfusion on the boy (Fionn Whitehead, “Dunkirk”), a Jehovah's Witness who, just months short of his eighteenth birthday, is refusing on religious grounds the procedure that would save his life. “The Children Act” will be shown at Harkins Flagstaff 16 Theatres on Wednesday, Jan. 9 at 7:00 p.m. Tickets are $12, or $9 for Film Festival members ($10 for full-time students), and will be available starting at 6:00 p.m. that day in the Harkins lobby. Tickets can be purchased in advance by calling 928-282-1177 or online at www.SedonaFilmFestival.org.